WHY WOULD I WANT TO STAND IN THE OFFICE? Unless you live under a rock you have probably heard that “Sitting is the New Smoking” or maybe that “Your Chair is Killing You.” We can thank James Levine of the Mayo Clinic for really bringing this subject into the spotlight back in 2014 when he published his research on NEAT, Non-Exercise Activity Thermogenesis. NEAT is the energy expended for everything we do that is not sleeping, eating or sports-like exercise. Dr. Levine was able to stimulate awareness around the fact that we sit a lot and that it is affecting all civilized societies. We sit during our morning commute, we sit at our desk, we sit in meetings, we sit at lunch, we drive home, we sit at the dinner table or restaurant, and then we sit and watch TV. And then we do it again the next day, and the next day… you get the point! This societal pattern has emerged as we have moved out of the industrial revolution where we worked in factories and were on our feet much more often. This was preceded by the agrarian period where we were doing back breaking work in the fields. Fast forward to today where we have become an information based society resulting in many of us sitting at desks all day and not benefitting from the physical movement of working in the field or in a factory. Dr. Levine has said, “Chair-living has proven so enticing that we have forsaken our legs. It is now time to find ways to get us back onto our legs.” Where this research really got Dr. Levine’s attention was the correlation between the lack of movement over several generations and the dramatic increase in obesity, high blood pressure, diabetes and other potentially very damaging health issues… all good reasons to think seriously about this subject! The Scandinavians caught on to this some time ago. As an example, in Denmark the government has mandated that all office workers must have a height adjustable desk (sometimes called a standing desk… more on this later). In the early 1980’s some very early adopters began experimenting with these new desks but they were generally considered odd or not practical and, of course, back then having a desk job was a privilege and sitting all day was thought to be one of the benefits of getting an education… this falls into the category of unintended consequences! OK…YOU GOT MY ATTENTION BUT WHERE SHOULD I START? 1. What type of work do I do most of the time? 2. Do I do a lot of keyboarding? 3. Am I on the phone a lot? 4. Do I have a good chair? Is it adjustable? What you need is an adjustable height desk, NOT a standing desk. Wait a minute did you just ask me about a chair? I thought you were telling me about standing desks. This brings me to my first and perhaps my most important point! A standing desk can be just as bad for you as a traditional sitting desk! If we refer back to Dr. Levine’s research on NEAT we will find that the real key is movement, NOT sitting all day and NOT standing all day either. What you need is an adjustable height desk, NOT a standing desk. This is an extremely important distinction and one that most of the media and many of the people that sell these products fail to understand or care about! The most important thing you can do for yourself is move on a regular basis. Remember, we are trying to replicate the experience of working in the fields or factory without all the heavy lifting and sweating. If you have an adjustable desk you can listen to your body and you can move periodically throughout the day. You now have the freedom to move when it is convenient and when your body tells you that you need to. Stand for a few minutes when you get to your desk after a long commute. Stand while you take a phone call. Stand after lunch to help maintain your focus and avoid the afternoon crash. Stand when your back feels a little tight or your neck is stiff. Adjustments give you freedom and that is good for your body and your mind! Let’s be honest. You aren’t going to stand all day and that’s good because you shouldn’t! The second key point I want to make is that when we are discussing an adjustable height desk we are talking about an Ergonomic Wellness Tool. Just having an adjustable height desk will not do you much good if you don’t use it properly. Just as buying new exercise equipment as a New Year’s resolution doesn’t help you if it just collects dust! 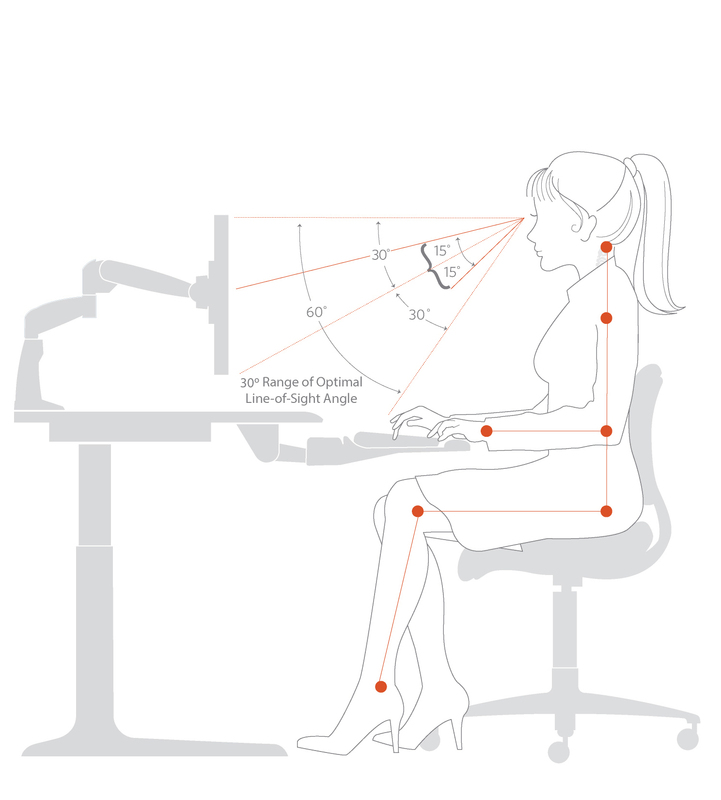 Ergonomics is a term you have very likely heard before. 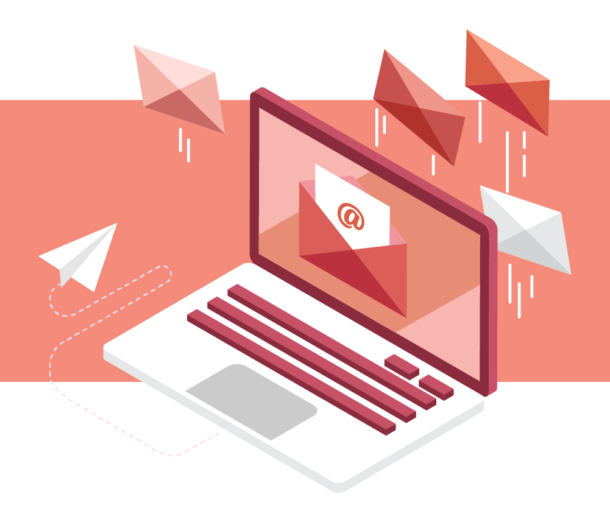 It is the practice of designing products, systems, or processes to take proper account of the interaction between them and the people who use them. Ergonomics started during the industrial revolution as an outgrowth of OSHA and was focused on helping factory workers avoid injury most often associated with lifting and bending or back injuries. In the eighties ergonomics began to evolve into the office and, as we began working on computers more, we saw an increase in the number of reported cases of Carpal Tunnel. Carpal Tunnel is defined as Chronic pain, numbness, or tingling in the hand, caused by compression of the median nerve in the wrist. It can be caused by repetitive bending and extension of the wrist, as in keyboarding, or by medical conditions such as rheumatoid arthritis and diabetes. Carpal Tunnel taught us that the typical 29” height of an office desk does not allow 50% of the population to work in the proper position or at the proper height when using a keyboard. Out of this increase in Carpal Tunnel incidences came the development of the Adjustable Keyboard Arm and Platform. Millions and millions of these systems have been sold over the past thirty years to retrofit the many millions of fixed height desks that are installed in offices all over the world. This brings me to my third critical point which is making sure this new adjustable desk that you are buying works in both sitting and standing positions. What I mean by “works” is that it enables you to avoid awkward working postures that compound existing health issues or create new ones. According to the most recent ANSI/BIFMA anthropometric studies, the average female in the U.S. workforce is 5’ 4” and requires a worksurface height of 24.5” when seated and 41.3” when standing. The average male is 5’ 10” and requires a worksurface height of 26.5” when seated and 44.8” when standing. These people are considered the 50th percentile of the workforce. The ability to meet the diverse needs of the average worker, not to mention the extremes of the shortest and tallest workers (known as the 5th to 95th percentile), can only be achieved with adjustable height desks that adjust from 22.5” to 48.5”. There are many options available in the market today…good for standing but not for sitting. There are many options available in the market today for standing desks but many of them are just that — good for standing, but not for sitting. They will raise to a height that allows you to stand and work in a proper position but, when you need to sit, the worksurface simply does not go low enough for normal activities such as typing or writing. This is especially true of the solutions that sit on top of your existing desk. They only address half of your needs and do not provide a complete solution. The act of standing up from a seated position has been found particularly effective at counteracting the detrimental health effects of sitting. The joint and muscle movement required to transition from one position to the other is where the real benefit is, not the act of standing itself. If you are going to invest in yourself or your employees it makes sense to do it right — the first time. Make sure the product that you are buying serves the purpose for which it is intended and that it meets the REAL needs of your workforce. The simple rule of office ergonomics is that you need a minimum of two points of adjustment. 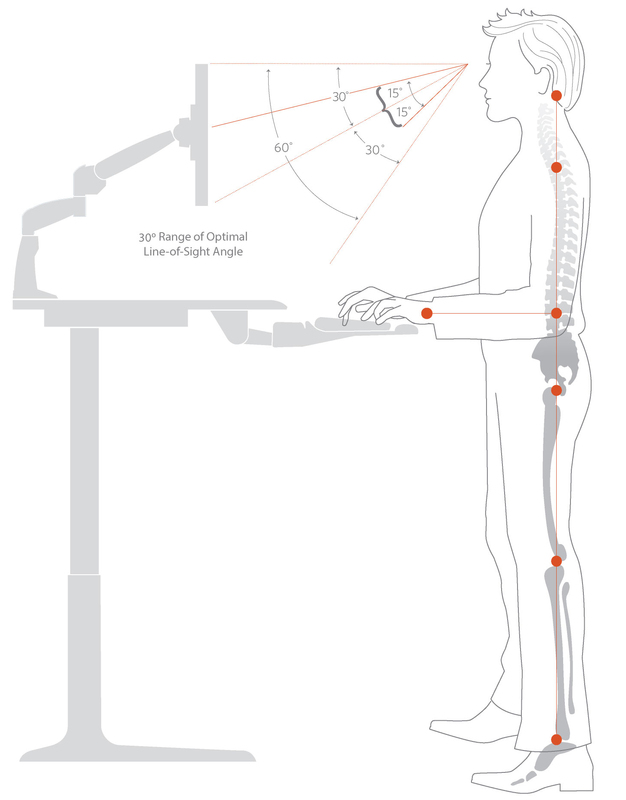 This typically addresses the position of the keyboard (affecting arms & wrists) and the position of the monitor (affecting head, neck and shoulders). If you have an adjustable height desk that meets the full ANSI/BIFMA requirements for adjustability, the desk will provide the proper height adjustment required for the keyboard and you will simply need to add a monitor arm to ensure proper alignment and positioning of your head, neck and shoulders. 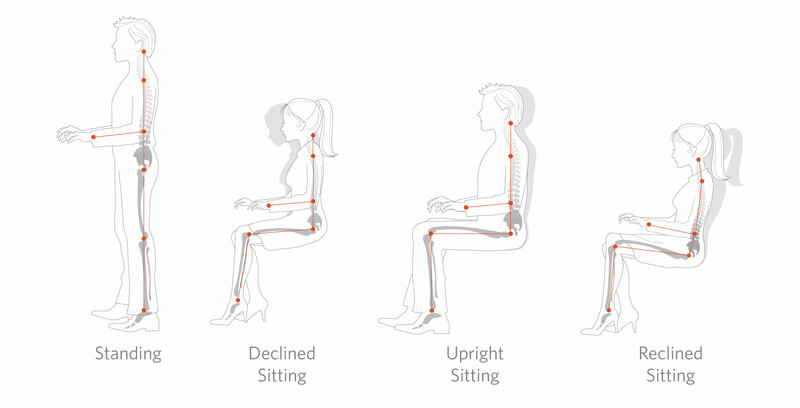 As shown in the infographic below, your forearms should be parallel to the floor and your wrists should be in a relaxed, neutral position – not bent forward or backwards – while typing and using the mouse regardless of which position you are in. Monitors should be positioned at eye level and approximately arms’ length from your body. The primary monitor should be placed directly in front of you (centered over the G and H keys on your keyboard) and secondary monitors should be positioned to the side that your mouse is used on. Properly positioning your monitor will allow you to maintain good posture, relieve stress in your neck and shoulders, and reduce eye strain. Individuals who wear multi-focal lenses will need to make additional adjustments to ensure that monitors are positioned properly for their needs. 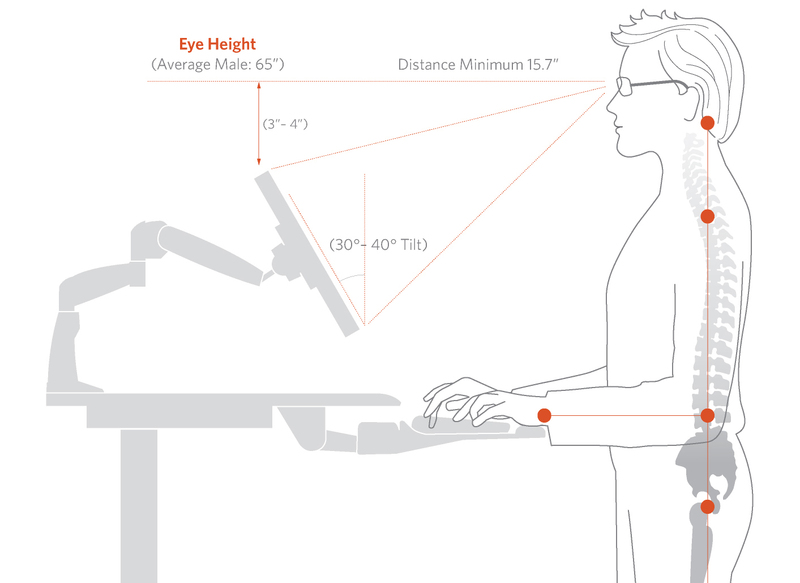 If you have a limited height desk or a fixed height desk then you should also seriously consider adding both an adjustable keyboard platform and an adjustable monitor arm to achieve these adjustments. You might be wondering why the monitor arm needs to be adjustable and why you can’t just set it and forget it. This is a great question. As mentioned above our bodies are all different. Some of us have long legs, others have a long torso. This makes it extremely difficult to maintain the exact position and relationship between keyboard and monitor when moving from one position to the other. 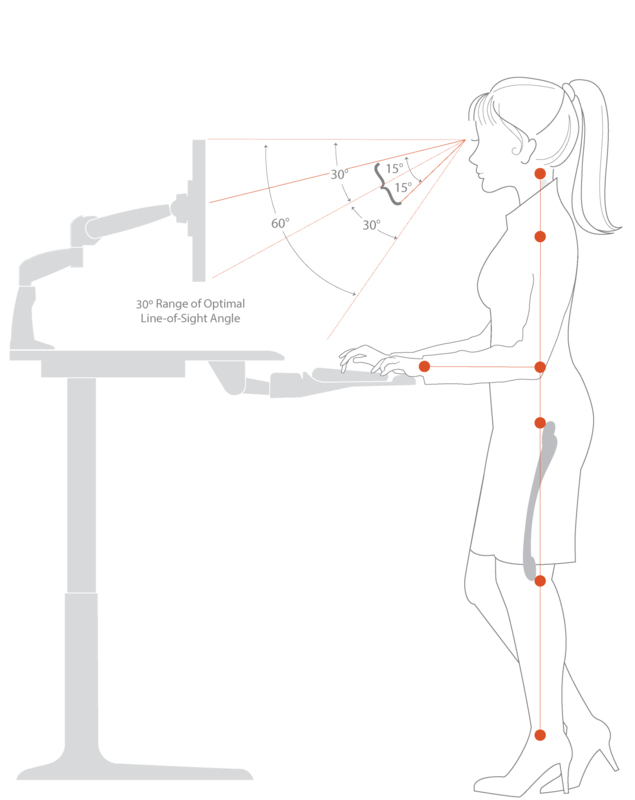 There are often several inches difference in distance between the monitor and keyboard based on whether you are sitting or standing. The final point about this goes back to the idea of movement. We may want to lean or slouch once in a while and that changes the correct equipment position as well. So having a solution that makes it easy to move is the only option that allows you to listen to your body and work comfortably. Having the entire desk move is ideal as it allows your keyboard, laptop, monitor, phone, coffee and all your paperwork to move with you. One of the biggest drawbacks of the desk top products is that the only things that move with you are the monitor and keyboard. That means you are reaching for the phone, or reaching for your paperwork, which is not only inefficient but places strain on your body. Your adjustable desk should not be a chore or create more work by being difficult to adjust. If you have to lift, strain or push you run the risk of hurting yourself. Manual systems and desk top systems require varying degrees of effort and the heavier the equipment on the desk the more effort required to move it, especially when moving to the up or standing position. Human nature being what it is, you may decide that it’s just not worth the effort and decide to keep sitting instead of dealing with a product that is difficult to adjust. Don’t make that mistake! The best solution to address ease of adjustability is an electric, height adjustable workcenter. It’s simple, reliable and easy to use; therefore, you will be more likely to use it. Your adjustable desk should not be a chore or create more work… The best solution is an electric, height adjustable workcenter. It’s simple, reliable and easy to use; therefore, you will be more likely to use it. I would like to refer back to Dr. Levine and his research one last time. His message was meant to urge us to move more and sit less. His research did not say we need to stop sitting… it simply indicated that we should sit less and move more. If you have found this information useful and plan to buy an adjustable height desk remember this… just buying it won’t help at all… you have to use it and use it correctly! As with any physical activity, your body will have to get used to working differently so I recommend small doses of standing initially. Stand for ten minutes every hour. Going to get coffee or going to talk with a colleague counts as activity. Remember we are trying to move not just stand. You will soon find that this has become a part of your daily routine and that it is second nature for you. After a few weeks or months when the novelty of your new desk wears off you may really need to make an effort to continue with this lifestyle change. The final point about pain is that if it hurts or causes discomfort that’s your body saying let’s do something different. If your feet hurt sit back down, if your neck is stiff stop staring at your monitor for a few minutes… listen to your body… move as often as you can throughout the day. We have a company slogan… ”your next position is the best position”… again, the idea is all about movement. The evidence is overwhelming that movement is good for our bodies and adjustable height desks can be a powerful tool for the millions of us that work at a desk! There are many choices today but I strongly encourage you to do your homework and be skeptical of those that just want to sell you something – it’s not just a piece of furniture. Get help from an ergonomics or wellness professional and buy from a specialist not just a reseller or furniture company. As is true in any growing market there are lots of short cuts to be taken and people that just want to make a buck off the latest trend… be wise, be careful and please be informed. You have many options but its best to be informed and choose wisely… here’s to a better you… I hope this was helpful! 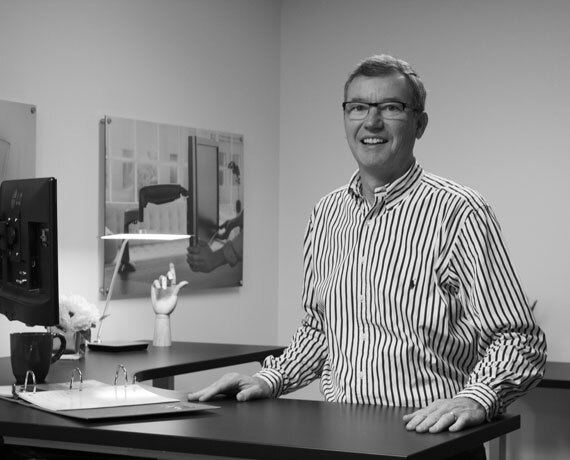 Charlie Lawrence is the President of Workrite Ergonomics, a twenty-five year old ergonomic accessories and furniture company based in Petaluma, California. He is a member of the OERC and his company is the Platinum Sponsor of the annual Ergonomics Expo held every November in Las Vegas.